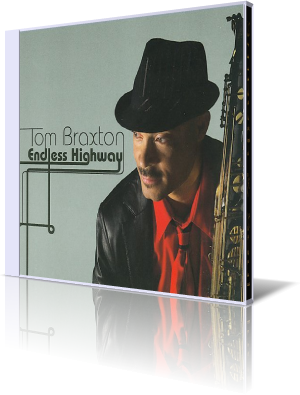 After Imagine This Tom Braxton returns with his second album for Pacific Coast Jazz entitled Endless Highway. Tom Braxton regards his own life as highway with many obstacles and odds. In this spirit starts the title song Endless Highway. All is in the groove and Tom Braxton blows the sax with a dynamic range and perfectly timed. Outstanding are the horn arrangement and Tom's fellow musicians Larry Spencer (trumpet), Pete Branham (alto sax), and Don Bozman (trombone). I also like the keyboard chords which remind of George Benson's Give Me The Night. Chicago producer and songwriter Tim Gant, who also worked for Brian Culbertson, Nick Colionne and Regina Belle, penned Just In Time. This is a great music show. Try to discover what is good for your soul and then do it! Tom's own Soul Purpose is to create a melody which stays in mind long after the song fades. I recognized the hook. Tom has dedicated the album to the late bass guitarist Wayman Tisdale. He writes in the liner notes: "My good friend, Wayman Tisdale, is now on the next section of the Endless Highway. He was a great friend and a fantastic musician that has left an enduring legacy. I have many wonderful memories of That Wayman Smile. This is for you, Tis! Thank you!" Braylon Lacy (Erykah Badu) takes the lead on bass in legacy of the late bass hero. Detour Ahead is Braxton's second collaboration with Tim Gant. The repeated performance of the main theme has a symbol character. Not always one can reach the aim straight forward. In the center of The Journey stands Tom's soprano sax perfectly underlined by arranger and keyboardist Eric Willis. Eric also performed on Tom's previous albums Imagine This and Bounce. Vocalist Dewey Bunnell (America) explained: "I really believe that Ventura Highway has the most lasting power of all my songs. It's not just the words — the song and the track have a certain fresh, vibrant, optimistic quality that I can still respond to." No wonder, that Tom Braxton chooses this song and presents with Arthur Dyer the ideal vocal interpret for his rendition. For every moment is a specific song. Open Road is designed to your travel cruising along the long and winding roads. By the way Tom is not only an excellent sax player but has also a good hand for keyboards and other instruments. Braxton's epic description of Distant Skies mirrors in various instruments from soprano sax to cello. His piano performance reminds me of Dan Siegel. The romantic Home Sweet Home features anew Eric Willis. Eric has performed with the likes of Tom Braxton, Gerald Albright, Wayman Tisdale, Les McCann, Bobby Sparks, and Roy Hargrove, among many others. An incredibly talented arranger, composer, and performer. Final tunes on this album are radio edit versions of That Wayman Smile!, Open Road and The Journey. Tom Braxton's signature sound is lush and sensitive like on his previous albums. With plenty of vim and effervescence Tom has taken his place in the smooth jazz world never forgetting his integral heritage.